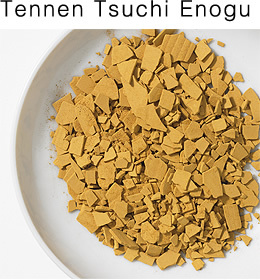 The pigments used in Nihonga mainly consist of "Tennen Iwa Enogu" derived from powdered natural minerals, "Shin Iwa Enogu" manufactured from artificial powdered stones and the newly developed Kyojyo Iwa Enogu. By separating the coarse and fine powdered particles of natural minerals, even the same color is capable of expressing various shades. Due to this, Nakagawa's pigment range consists of approximately 1,300 colors. Gofun, the "white" of Nihonga, is used as a base and plays a very important role in the creation of Nihonga. "Suihi Enogu" and "Tennen Tsuchi Enogu" are used as a base for Iwa Enogu due to their characteristics of being fine, evenly-spreading, and easy for colors to adhere to. Tennen Iwa Enogu is created by handpicking high quality minerals and precious stones born from nature, pulverizing and levigating these to extract their natural beauty, then sorting them into particles. Shin Iwa Enogu was made to supplement the color hues of Tennen Iwa Enogu. Metal oxide is added to a glaze constitute, then fired and melted at 800 to 1000 degree Celsius to create the colored block or "Shin Iwa". From this point onwards, Shin Iwa Enogu is manufactured using the same processes as Tennen Iwa Enogu. Kyojyo Iwa Enogu uses the same manufacturing method as Shin Iwa Enogu but does not contain lead in its glaze constitute therefore prevents environmental pollution, possesses good decorating characteristics and excellent durability against environmental-polluting gases. Suihi Enogu is refined in water (sui) and then dried (hi), which is where its name "Suihi" derives from. A robust pigment with high light resistance is selected, Gofun is added then, once put through the suihi refining process, laid out on a cedar board in a thin flat shape to dry naturally. 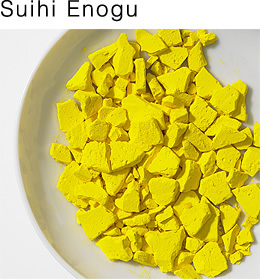 Suihi Enogu is extremely fine and is known for its excellent color forming characteristic. 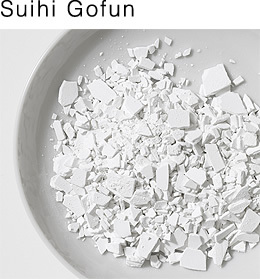 Suihi Gofun is Japan’s traditional white. Its base ingredient is the naturally occurring Itabo oyster shell, which is left outside to weather for 10 to 15 years, before being sufficiently bleached in water at the same time as being pulverized in a wet-type stone mill, then put through a levigation process and finally laid out on cedar board in a thin flat shape to dry naturally. The resulting substance is known as "Ita-nagashi Gofun". There is also a powdered form of Gofun. Tennen Tsuchi Enogu is a pigment which has been used in both the East and West from antiquity. High quality natural earth gathered in Japan and countries across the world is put through the suihi refining process then laid out on cedar board in a thin flat shape to dry naturally. Tennen Tsuchi Enogu is extremely fine and is known for its natural, soothing textures.